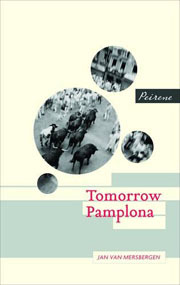 The “fight or flight” response takes on a new dimension in Jan Van Mersbergen’s new novel Tomorrow Pamplona. For the main character, a boxer named Danny, jogging in the rain isn’t simply for exercise, as we see him accepting a ride out of town with an unusually generous man. Immediately, a sense of tension is palpable. Where are they going? Why is the driver, Robert, so accommodating to the stranger he’s picked up? Is either man in danger from the other? The questions add up as the two journey out of town, and Robert explains that he’s headed to Pamplona to run with the bulls. With both boxing and Pamplona in the novel one may think of Hemingway, but Van Mersbergen isn’t trying to imitate him or allude to his novels. Instead, he composes a theme of escape: As Danny stares silently through the car window, he observes everything in constant motion, and he seems to notice the world around him for the first time. The setting is significant too, for Pamplona is the destination of many who travel to Santiago for a religious pilgrimage. Is Danny ripe for conversion? Throughout the narrative, flashbacks reveal that Danny left trouble behind, but never fully explain the nature of it. Foreshadowing likewise suggests what may yet happen, and the contrasts between both continue to increase the tension. The two men are never completely comfortable with each other; they certainly aren’t on a buddy-style road trip. Robert tries to place himself in a position of authority, lecturing Danny on parenting, marriage, and the thrill of risk. Danny, for his part, silently listens while reflecting on his own experiences and toying with a child’s small metal car. It underscores the theme of transportation, but also pushes the reader to consider Danny as a child—especially when he accidentally breaks the car. Van Mersbergen writes sparingly and doesn’t presume to tie up all the threads he’s unraveled. Many questions are left unanswered. He places seemingly random scenes in between carefully scripted interchanges, with the reader forced to guess at the significance—a technique that actually pulls the reader in more tightly. What is the significance of the elderly woman who swims the river at night? How does the boxing promoter, Gerard, fit in? Was Danny set up by false friends? These questions and the descriptions of darkness and shadows along with blinding Spanish light, heighten the suspense without making the reader feel manipulated. On the way to Pamplona, Danny and Robert meet a restaurant owner who discusses the running of the bulls with the two men. An American boy had been killed, and in a particularly relevant interchange, the man explains how: “He fell and did not know that you must stay on the ground. So he got up again. . . . Everyone knows that if you fall over you should stay down.” For a boxer, staying down after a fall signals defeat. Will Danny run with the bulls, and if he does, can he resist his training and inclination? The novel offers more than simply a quest motif, although its “road of trials” fits the format. Danny plays a tragic hero with the requisite tragic flaw, but he steps outside the genre with his total resistance to Robert’s influence. If quests had round-trip tickets, that would better fit the structure of this novel. Although the ending doesn’t do justice to the suspense that preceded it, Tomorrow Pamplona takes the reader on a satisfying journey.